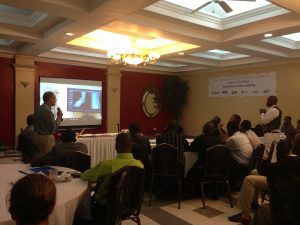 A partnership between the American Academy of Orthopedic Surgeons (AAOS), Partners in Health (PIH), SIGN Fracture Care, Project Hope, and the Foundation for Orthopaedic Trauma (FOT), HAAOT consists of paper presentations, panel discussions, and lectures from Haitian and international physicians. The third annual HAAOT conference took place from April 9-11, 2015, with over 100 attendees, the majority of whom were Haitian orthopaedic residents. While conference proceedings in years past were centered around didactic lecturing, participants requested that this year’s conference include more interactive modes of learning. To meet this need, the third day of the conference was split into three participatory blocks, one of which was the screening of JoMI’s bimalleolar ankle fracture video by Dr. Michael Weaver at Brigham and Women’s Hospital. With live discussion led by three expert American orthopaedic traumatologists, conference participants watched this video, pausing frequently to ask questions, discuss key points, and debate management strategies. The discussion was so lively that it was difficult to finish the 40 minute video in the two hour session, and participants of all nationalities left with new ideas and inspiration. After the session, multiple participants expressed how much the video screening added to the educational value of the conference, because it allowed for discussion of surgical techniques in a way that lectures cannot. The JoMI video screening was a huge success and a great addition to HAAOT 2015, and we look forward to including it in next year’s agenda as well.